Just wanted to say a huge thank you for Windsor stool weekend. Great fun, good bunch of fellow stool makers, spot on tuition and thanks to your wife for delicious lunches etc. Thank you for arranging such a fantastic weekend. Once again you provided a super course which was both instructive and pleasurable. Thanks also to your wife for the excellent hospitality. I thoroughly enjoyed the practical work which was greatly facilitated by the excellent workshop provision, comprehensive range of tools and equipment, and good fellowship. Your patience and excellent tuition was an outstanding feature of the course, as was your friendly approach to every challenge encountered. I thoroughly recommend, without hesitation, the “Windsor Workshop Experience” to anyone considering signing up. Once again thank you for a super activity in such delightful surroundings. Once again many thanks for a super weekend. Lots of tips, tricks and wisdom. It has reinforced my belief that people who work with wood are nice people to be around. Please pass on my best you your wife who made us feel very welcome. Hope to return soon. technical tasks, and break them down into simple chunks, so that even a complete novice like me gets to enjoy the process of making a Windsor chair. Looking back on the course, I learnt many new skills and used all sorts of machines and tools that I’d never used before. We crammed a lot into each day and you managed to keep us all on track and working well together. I will miss sitting around your table for Lunch, Tea and Coffee, Cakes and Biscuits and chatting with the other people on the course. I attended the rocking chair making course in January. It was a week’s course and at the end I left with a rocking chair which was well made, comfortable and aesthetically pleasing. The course was very enjoyable with a purposeful but stress free and friendly atmosphere and with opportunities to relax in coffee and lunch breaks. James was an excellent teacher. Every stage in the chair making was explained clearly and succinctly and superb preparation and organisation meant that people knew what they were doing and had the tools to carry it out. Help was always on hand if it was needed and good advice given. It was fun and I was very impressed with what I had achieved with the help and support. Family and friends were also impressed! I attended the Rocking chair course at The Windsor Workshop, which was my second course there. As before, the course was well organised and the workshop is perfect for group learning. James is an excellent teacher, being both knowledgeable and able to put across ideas and techniques. The pace of the course is fast enough to keep you interested and challenged, but at the same time you do not feel rushed at all. The group all produced superb chairs, even though we were a mixed bunch with different levels of woodworking experience. James’ hospitality was top notch and the food and drinks were amble and tasty. I can’t recommend the course highly enough for it’s stimulation and enjoyment and the end result being a chair that I am really proud of. For me, the week spent at The Windsor Workshop was most enjoyable and I can’t wait to go back there again. Wow! What a week! It was so totally unlike anything I had ever done. So many challenges but I absolutely loved it and I am so chuffed to be able to show my family and friends my wonderful chair. Thank you so much for your help and patience. I may well return at some point as I would love to make a couple of children’s high chairs. What a fantastic week with great friends working as a team to build a beautifully designed Windsor chair. James you are a master of your craft and a top man. Every stage of the making process was explained in a clear no-nonsense way that was easy to follow. Thanks also for feeding us with great food and chair making knowledge! We all agreed that it was probably the best organised course we’ve been on, which is saying a lot! I really enjoyed the course so much and very, very happy with the chair. All my family ‘user tested’ it yesterday and they all think it is really comfortable, which is very much down to your meticulous design, planning and experience. Thank you so much for sharing that with us. It was a great week with a great gang! I had such a great time James, learned so much and came away with a beautiful chair. Your passion for the craft in infectious which makes the learning so positive. I also really liked that you generously allowed us into your home to have lunch and tea breaks. It was a hugely welcoming experience and I’m sure friends of mine will book courses when they see what I made! Such a good week, thank you so much James for all the knowledge to make this beautiful chair. Thanks also for your generous hospitality, great course and a brilliant group of guys to have shared this experience with. This is one very happy customer! Thank you so much for a fantastic stool making workshop. We are so proud of our stools and (clearly!) couldn’t have made them without your expertise and infinite patience. We were even asked if we would sell them on the journey home… (No way). You also took such good care of us with the lovely refreshments and we enjoyed testing your various beautiful chairs during the breaks. We’d highly recommend this course to others – from complete beginners like us, to woodworking enthusiasts. A great week, lots of learning, laughter and some cake! Many thanks James. What a great course – I spent last wk on one of James courses, it was very enjoyable. The location, facilities and content were spot on – and I now have a lovely chair sat at home to show for it. A big thank you again for a such an enjoyable weeks course making a fabulous chair which has got a very positive approval from my wife and daughter. They both said I should make some more chairs! Just spent a fantastic week making a Windsor english double bow chair. Brilliant result thanks to a great teacher and a great bunch of students. James Mursell of the Windsor Workshop is a genius with wood, tools and people. I and 7 other unknown guys from diverse backgrounds and skill-sets signed up for a 5-day double-bow chair making workshop. We had a whale of a time, learned much about wood, tools, ourselves and others and still managed to hand-craft a handsome chair each in the idyllic West Sussex countryside. James has a long list of returning customers – now I understand why…and I’ll be back ! ‘As a complete novice to woodworking, I had some doubts about the claim that ”absolutely no experience is necessary” but decided to give it a go. I need not have worried. The course was, like the chairs themselves, beautifully balanced and James has, as a tutor, that rare gift of being able to bring out the best in the student, no matter what their level of ability. It is difficult to list all the many new technical skills I was introduced to on the course, there were so many. In addition, I got a real feel for workshop practice and how to approach tasks calmly, safely and efficiently. The setting and hospitality were an added bonus which contributed to what was a thoroughly enjoyable and satisfying week. Since my return home a few days ago, my chair has already been received with admiration from friends and family and, given my starting point, sheer amazement that I was able to produce such a wonderful piece of furniture at all, let alone in such a short space of time. Thank you very much for another thoroughly enjoyable week at The Windsor Workshop. As always, I learnt a great deal and got much pleasure from listening to your teaching and building my chair with your patient guidance. I wish you a successful and enjoyable year. I’m emailing to offer my profound thanks to you for delivering yet another absolutely superb course last week; the pace of instruction was perfect for our relative competences, while the content was jam packed with some very useful nuggets from your own immense experience of Windsor Chairmaking. I think we all travelled home justifiably proud of our achievements and each in possession of a most-elegant and graceful Windsor settee. Thank you also for the equally legendary lunches and tea breaks; the victuals were truly magnificent. Good luck with all your future courses! I attended a 5 day chair making course with James Mursell of The Windsor Workshop. This is the first time I’ve attended anything like this, but the course exceeded all my expectations. James is a friendly and excellent instructor. His delivery is clear and concise, and his knowledge of the business of making chairs, from its history to the practical construction is encyclopaedic. James is calm and reassuring, with a good sense of humour and what seemed like endless patience. The Windsor Workshop is set in a lovely rural location, and the workshop is well stocked with well-maintained tools and equipment. The working days were well paced and we were always busy, never waiting around to go onto the next step. No one was left behind. The days were passed with coffee and biscuits mid morning, a hearty lunch and tea and cake mid afternoon, all served in the farmhouse next door. I took pieces of timber that to start with looked like bits of roofing batten and regular planks of wood and turned them into spindles and a seat, using a combination of modern and traditional methods and tools, and made a beautiful chair that I am very proud of. I can’t praise this course more highly. It was simply exceptional. Last week’s course to make a ‘Continuous Arm’ chair was a fantastic experience. Hard work but very satisfying. Well taught, well organised and the resultant chair has had a number of complimentary comments from my friends and family. Thank you James and I maybe back as the rocking chair looks tempting. Many thanks for a wonderful 5 days when you taught me how to make the curved back Windsor chair. You gave us all a great mix of knowledge and practical skills, topped off with the tips and tricks that would take years and many mistakes to learn in any other way. And lastly – for anyone like me travelling 12,000 miles for the course – the components just fit in a large suitcase for the airlines, and weigh less than 5 kg. I will be recommending this to anyone with any interest in wood or making chairs. Thanks for a wonderful week, it was great to see how a Windsor chair comes together, I think the course structure is great and the end product something everyone can be proud of. Thanks for going out of your way to explain your methods for tool sharpening, design process and for sharing your enthusiasm for chair making with us, I found it very inspirational and can’t wait to apply what I learnt to future projects. When you arrive at James’s workshop and are surrounded by a vast selection of wonderful Windsor chairs it could lead you to wonder how you will ever manage to leave with one of your own on the following Friday. Rest assured, James will gently walk you through the whole process and you will have fun doing it too. A group of like-minded people gel together so that no matter what your level of ability is you will enjoy the week and end up with an heirloom piece of furniture as the result. James runs the course in a quiet, professional manner in a workshop that is tailor made for teaching the art of chairmaking. The facilities are excellent and the catering and hospitality are second to none. All in all, well worth the 1000 mile round trip I made to attend the course and I cannot recommend it highly enough. Thank you so much for a wonderful week. Thank you for your energy, enthusiasm and leadership. Your innovative approach has put chair making within the reach of lesser mortals. In no time you transformed eight diverse individuals into our lovely, committed team. It has been an honour to share in this experience. The chair was well received at home. Its elegance and beauty exceeded all expectations. The Vicar, never short for words, silently studied the chair for several minutes before pronouncing judgement. You have refined the design so it looks good from all viewing angles. It even sounds good when drawn across carpet or lino. I am still looking at it with disbelief. The chair is a permanent reminder of a very special time and will always bring back fond memories of you and the team. Thank you for a fantastic week making my English double bow. It was great fun and I am thrilled with my finished chair! Thank you so very much for such an enjoyable week. It was very satisfying! Thanks again for another brilliant course! Excellent. Extremely well taught, with very enjoyable breaks and lunches – sincere thanks! I attended your continuous arm workshop last January (2015), and I have to be honest I think it may have changed my life, not that I will be retiring from farriery, but has revived my passion for wood! Over the last year I have been gradually collecting tools and reorganising my workshop for stool and chair production! Thanks again for a really splendid week. I enjoyed learning a bunch of new skills and was delighted at the result. I returned home with my trophy, greeted by universal astonishment and wide-eyed disbelief! I would like to thank you for the wonderful week. It was truly inspiring and I am so pleased with my fabulous chair! I hope to come again and try another one soon. Thank you for a very enjoyable, informative and well run course last week, together with a truly great end product. I have recently completed the Continuous Arm Windsor Chair Course run by James in his fabulous facility. I cannot praise him, his facility and course construct, highly enough – an extremely talented craftsman with a natural gift for instruction. He presented all aspects of the course with confidence and flair. The workshop was suitably equipped and the student numbers perfectly matched to cater for differing skill levels and abilities. Aside from the hands-on workshop time the refreshment and lunch breaks were substantial and most convivial. The resulting chair is something to be proud of and will be a highly visible and constant reminder of a most satisfying experience. In Trip Advisor Terms this is a 5. As a member of the Armed Forces in my resettlement phase, I will be recommending this experience at every opportunity as well as keeping the Christmas and Birthdays wish lists populated for the foreseeable future. 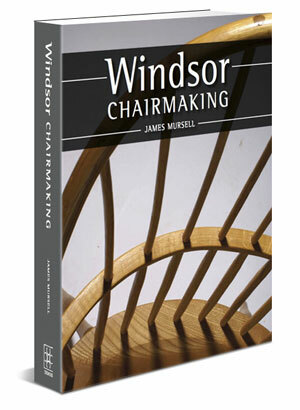 James is an excellent instructor and a mine of information on anything to do with Windsor Chairs. His workshop is spacious and well equipped with razor sharp tools. He manages to keep the pace going and is always available for deliver answers to the numerous questions posed. It is amazing what you can learn in 5 days, plus you get to take home a fine chair! I chose James’ Windsor chair making course, because I thought I would learn lots of new skills. I was not disappointed. From the steam bending on day one, through to the final assembly on Friday, was a wonderful experience. You can learn a lot from reading books, but nothing compares to the ‘hands on’ learning with James; his patience, encouragement, knowledge and good humour make for a most enjoyable week. The food is delicious too! I am a sucker for a good thing and have just completed my second chair at The Windsor Workshop under the tutelage of James Mursell. I am absolutely delighted with my second beautiful chair, the first was based on an American design the second English. A spacious, well-equipped workshop, convivial fellow chair novices, expert gentle guidance and superlative lunches all conspired towards a memorable week and a chair that is a delight to look at and as important – comfortable to sit on. I just wanted to drop you a line to thank you greatly for providing such an excellent course for us all last week. That my chair has been accorded such universal acclaim by chums is solely down to your wonderful design, patient supervision and gentle guidance, and nothing to do with my (in)ability. I thought the course was simply fantastic, appropriately paced and stretched us all. Your victuals, too, were so welcome and so tasty. Moreover, thank you for the recommendation on your website of the White House as a B&B to stay at. Lindy Walby was a absolutely charming host, while the B&B was very comfortable and warm – a perfect and reasonably-priced place to stay while on your course. I just wanted to let you know how much I enjoyed your course last week. Everything about it was good. I learned so much and through it all your good humour, intelligence and integrity shone brightly. I feel fortunate to have chosen the very best course available, for my initiation into the world of chair-making. The Continuous Arm Chair course was exceptional in every way from the warmth of the reception on arrival to the celebration of completing the chair at the end of the week. James supplies clear instructions and with his leadership you are soon engaged in the process using the full tool set and equipment provided in his extensive workshop and ancillary facilities. We were a mixed skills group but with James attentive eye, each participant was able to keep up the pace and meet the timetable set for the week. Some of the stages involve team work and again James engendered great group energy to tackle some novel applications like steaming and bending the arms. What made it for me was the ability to make the chair using traditional methods with my own hands and use new tools like the Travisher with confidence. As the week progressed the chair became a reality through a series of well structured sessions. This is an outstanding course I would recommend to any one who feels they would like to make a chair; James will give you the skills and confidence to succeed. It is also excellent value for money and the refreshments provided are second to none. I just want to say how much I enjoyed the challenge of the course! I smile every time I look at my chair – can’t believe I made it. Good luck with the next six! My wife gave me the chair course as a Christmas present and what a fantastic week myself and five other people have had making our Windsor chairs. The instruction and organisation at your workshop is brilliant not to mention the delicious refreshments! I am now sitting on my chair as I write having had a very fulfilling week! Many thanks once again. Many thanks for your excellent course. I must admit that, having been given the course as a birthday present by my wife and having no previous experience of working with wood, I arrived on Monday morning with great apprehension for what I had let myself in for; seeing the completed chairs in your workshop only increased my fear. I should not have worried, for with your very clear instructions and demonstrations and breaking each task down into simple steps, even I was able to attempt each stage and if things started to go wrong you were always quickly on hand with infinite patience to help. I think we all learnt from your example and as the week progressed started helping each other out. By the middle of the week, I was actually looking forward to returning each morning. Like everybody else on the course, I am now the proud owner of a lovely piece of furniture, built (mainly) by myself and in addition I now appreciate the many hours of work and techniques needed to construct it. Thank you once again for a very enjoyable week, including the great lunches, etc. I will certainly be recommending your courses to my friends and may even try another one myself in the future. I just wanted to thank you for a most enjoyable week. I think it was probably the most satisfying thing I have ever done and the chair is beautiful. Thank you so much for your teaching and encouragement and for the hospitality! I look forward to making another one in the future. When my son and I enrolled on your March 2014 course it was with some trepidation that we looked at a picture of the seemingly fragile double bow windsor and doubted if we would be able to complete such a lovely piece of furniture in just five days. With your expertise and relaxed guidance we completed the chairs and learnt techniques, procedures, characteristics of different woods and about the long history of windsor chairmaking. All this combined with convivial company, excellent fresh food, a light and airy workshop (well stocked with sharp tools), set in beautiful Sussex countryside and blessed with perfect spring weather. I’ve done a few craft type courses but this was, undoubtedly, the best of the lot and to do it in the company of my eldest son put the icing on the cake. The taste of your afternoon teas still lingers! Now onwards to four bow-back side chairs and a Rocker. Thank you for an absolutely brilliant week in your workshop producing a continuous-arm Windsor chair. Everyone that has seen the chair cannot believe I made it and also that they can actually use it! At the start of the week when you outlined what we would be doing I really did not think that we would have time but you were spot on. No one was left behind and we were all at the same stage at the end of every day. This is without doubt the best and most rewarding course I have ever been on. Good company, excellent instruction and something really tangible to take away and use. To start with a lot of raw timber and produce a piece of furniture is really fantastic and I would recommend this course to anyone regardless of experience. Oh and thanks also for all the plentiful food, the scotch eggs were lovely! All the best for the future I am sure I will be back when we find room for another chair. Thank you for a brilliant weeks chair making course! Being a septuagenarian power tool freak it was a bit of a shock to the system to handle a rasp and a travisher but great fun and very satisfying. Your course was a birthday present from my children – I may have to ask you to send me a note confirming that I did indeed make the chair. They can’t believe : a) how good it looks; b) that one can actually sit on it without it collapsing; c) that you managed to sustain my attention for a whole week. Thank you again – and also for the excellent lunches! Thank you so much for a challenging, enjoyable and inspiring course. Deep down, I thought your claim at the beginning of the course that we would all be going home with a completed chair was overly optimistic. Despite a wide range of abilities and speed of work, you made this happen. I would recommend this course unreservedly to anyone, even if they think they can’t make a cup of tea, let alone a chair! Thank you James for a brilliant week! We were totally absorbed learning and understanding all the skills and techniques required to create our Continuous Arm Chairs last week. Thank you for all your hard work and effort preparing the course as well as delivering it. We began with just squared basic pieces of wood, learnt how to steam and bend, trim, shape and finish these and as they took shape it became a real chair to be cherished and protected! The draw blade, spoke shave, adze and travisher became useful tools as we learnt how to handle them to best advantage. Tackling and understanding the angles and plane lines to drill and fix the spindles and legs was daunting but with your support it was all achievable!I can now proudly admire my chair, sanded and finished, and remember an absolutely brilliant week. The food was lovely too and the huge dish of tasty tomatoes were a definite hit with not a single one left at the end! Thank you so much! May your passion continue to teach many many more students! Hope this email finds you as good as I feel, after making my fabulous Windsor chair at your workshop. I am still sitting admiring a great piece of workmanship, created with your professional tuition. Unbelievable, seeing as I normally have difficulty in using a saw! The number of people who have admired it and made the comment “I didn’t think you would be able to do that Rich” is amazing. Thanks so much James for a great week in providing a complete amateur with belief that he could make something so beautiful. Thank you very much for the opportunity to make my own Windsor Chair. It was easily the best course I have ever attended! Your experience, thoughtful preparation, excellent teaching and hospitality all made my week one of the most enjoyable I have had for a long time! When I saw your completed examples of chairs at the beginning, I was very nervous that I would be able to make one successfully. However, with your help and direction, you made it a pleasure. It is a very comfortable and elegant chair. My wife was very impressed and also some friends. Thank you for keeping us all together as a group and not letting anyone fall behind and for showing us many helpful ideas that you have picked up over the years. It was a wonderful week, meeting new people, working quite hard, but having a great reward at the end. Just a quick note to say thank you for the excellent weekend we shared with you and your wife whilst making our stools. We still both ache in places we didn’t even know we had places, but the two stools are now in pride of place in each of our homes and make us smile and forget all the aches and pains. It was a very pleasant experience and the first time I have ever made anything with so much pure hand-craft involved. Being an engineer, I tend to do things with the minimum of manual effort, if I can arrange it. Making the stool showed me a whole different way of doing things, and gave me the strange realisation that a slightly wonky circle and a ripply top were much nicer than geometrically perfect ones. Thank you again. I thought that making a double bow Windsor chair in a week was a tall order, but with James’ forward planning, systematic approach to teaching, ‘can do’ attitude and ways of ensuring that any slight mistakes just turned into another part of the process resulted in everyone coming away with a chair to be proud of. The ‘Windsor Workshop’ helped enormously. Light, spacious and equipped with every tool you might need, plus a few you might not, but which allowed for short cuts when you fell behind. However, this did not happen too often as James meticulously planned out each day to ensure that come 8.30 the next day you are at exactly the right point to move on. I enjoyed the week a great deal, improved by the good company, tasty lunches and in our case bright warm weather. Could I now make a chair without help? With a few more tools and developing a system for bending ash the answer is possibly. With James’ book which I only got a chance to read after the course it becomes more probable as this gives a lot of tips and describes the methods used during the week in a great deal of detail. However, I think I will be returning for a second go to develop the pair before I produce my own family heirlooms! 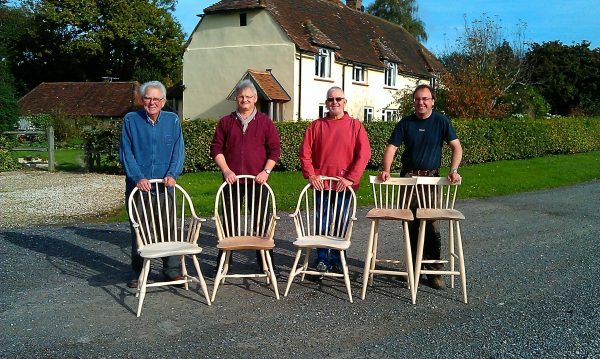 I have just finished James’ course, along with five other all very happy chairmakers. James uses traditional methods and tools, and imparts myriad tips and techniques along the way. Its a well-paced course but every moment is filled and its surprisingly physical. We all came away having thoroughly enjoyed the week, each proudly bearing a beautifuly built and well-designed chair. One of the best courses that I have ever been on. Thank you so very much for this week. It has been brilliant. You set a brilliant tone and have a great way with teaching. And we made beautiful chairs too. Thank you for a really excellent and stimulating workshop and I will definitely be taking chairmaking further. A truly excellent course. James is a fantastic teacher who makes it a relaxed and friendly environment in which to learn. If this is your first taste of woodwork, or if you are just looking to make something a little different, I am sure you’ll love making a Windsor chair with James. Really enjoyed the course this weekend – and very pleased with my stool! Everyone here very impressed with my handiwork! Very many thanks James for a wonderful week! I did wonder if I would be able to accomplish something akin to a Windsor chair but with your help, patience and guidance I now have a chair of which I am, I think, justifiably proud! Not only was that surprising but the fact I can still fit in it after all the delicious lunches and cakes each day…….. the group and the sunshine was a really bonus. Again, my thanks. Excellent course, gifted chairmaker and teacher, lovely surroundings, perfect workshop and wonderful food. Took home a stunning chair. When can I come back? Just a quick email to say thank you for the course last week! It was such a great experience to be down at the workshop and begin to get an insight into this wonderful craft. The delivery of the course was excellent and from an enjoyment perspective it was fantastic. You manage to create a great atmosphere, and that sets you aside from alot of other course providers. I think we all felt very comfortable in your presence and around the workshop. It was refreshing for me to be influenced by your ethos and attitude to this great craft, teaching me to celebrate the nature of products touched by a person rather than a machine-i found it very inspiring and liberating compared with my regular work with tools. Since I have returned from the course and had time to think, I have no other option but to persue chair making further. It feels like I have discovered what woodworking should be like…so thank you! I’m looking at my Windsor chair and I’m struck by two things: Was this thing of such beauty really a log a few days ago; and was it really me who created that thing of beauty (albeit under a heap of your expert guidance)? I’m amazed that the answer to these questions is “Yes”. I really have to say “Thank you” not only for providing us with such expert tuition, but also for making the Course so enjoyable, for gelling the group who were all from different backgrounds together, and for giving us confidence to take on projects that you had no inkling you could successfully achieve. So ….. Thank You. My reason for writing is to thank you for the course. Quite simply it was one of the best courses I have been on. I learnt a lot, met intersting people and had a lot of fun. I congratulate you on creating such a welcoming and informal atmosphere which put everyone quickly at their ease and allowed us all to develop a whole new set of skills very quickly under your watchful eye. I quite surprised myself that I turned out such a creditable chair at the end of the week. I am enthused to move on to making an armchair soon. However I think a bit of training on spindle carving is still needed! I would like to record my appreciation for a most carefully thought out course of instruction. Your attentive teaching combined with a sound perceptiveness as to when and how help is needed by struggling students will be remembered. Would there be space for me to attend an intermediate course to be shown how to make the Continuous arm Windsor chair? Thanks James. We had a fantastic time last week and are still smiling when we look at our chairs. Thank you very much for an instructive course which was great fun.I have not been on a woodwork course since I left school, I did not know what to expect. I would like to recommend this basic course to anyone regardless of any skill before hand. Brenda came to the course with no woodworking skills but with you help and guidance she kept up with the group and went home with a really high class chair. This is an enormous feather in your hat. As for myself I really enjoyed myself. I have some skills but no real turning ability other than the odd knob decorative spindle etc. I had never worked green wood, never used an adze had little idea of how to set out leg splays, though I had in the past made many a bent bow and turned spindles but never shaved spindles. Now I feel empowered to go forth and make Windsor’s , I know how to make an efficiently bender with a winch ,pegs and wedges which makes my home brewed efforts look daft. In a day or two I will clear the decks and get some green wood ordered make a winch bender, shorten my steam chest with a blank make a bending centre jig and off we go. I can not recommend your course highly enough, instructive , fun and as a bonus you have a chair to copy, or a least remind you of how you did it. Twenty five years ago, after I gained a H. N. D. in engineering, I discovered WOOD, a natural material I had an instant affinity with. After working with it for the subsequent twenty five years in the form of cabinet making,( kitchen cabinets for the last fifteen years), it had all turned a bit stale. A change was long overdue, so I signed up for a week’s Windsor chair making course in Sussex. Having now been on one of James’s courses I can, without hesitation, recommend it to anyone in a similar situation. The enthusiasm for this natural material; the wonder of its composition; the respect for the way I can use it, the grain ,the colour, all this has been rekindled. The working with hand tools again, has, no doubt, contributed to this re-discovery of my love for the wood itself. How exciting to see the workshop’s 2010 look in your latest newsletter… I think fondly back to my days in your course and the magical corner of England that is Pulborough. Sadly, a babysitter left my chair outside on the exposed porch unbeknownst to me, and in the torrential rain that night and subsequent hot drying sun of the next day, my seat cracked all the way through. I was livid with rage and broken hearted…I will just have to repeat on a course in the not too distant future… Now that we are back in the New England, however, the logistics are just a bit more complicated. I am just back from a wonderful week at the Windsor workshop building a chair with James Mursell. I cannot praise James enough for enthusiastically guiding us through the process from cut logs to completed chairs. His tuition is informal but clear and detailed. We bombarded him with questions all of which he was happy to deal with. The workshop is a very pleasant working environment and is well equipped with good quality tools and machines. Generous teas, cakes and lunches are all provided and break discussions were as enjoyable as the chair making. I am very grateful to James for a most fulfilling week, a chair of which I am proud and much new knowledge. You know the type – beard, plastic sandals, smock top, a passion for country crafts, wattle daubing, wurd nurdling, country fairs and half timbered Land Rovers, if there was such a thing. Well, just for once you would be wrong. James Mursell runs a Rolls Royce of a course with tact and infinite patience. He does not, as you may have suspected, play the fiddle or country dance. He plays decent music on the stereo. He will teach you and help you make a chair: not any ol’ chair, but one you made yourself more or less from a raw log. And forever after people will say “That’s a lovely chair” and for the rest of your life your chest will swell with pride as you say “I made that”. Go on, sign up – do something useful. It’s cheaper than a cruise, fun, and far far more satisfying. I must confess to having been both apprehensive and a little skeptical that I could actually make a chair in just five days. My doubts were banished as soon as I met James in his modern and beautifully equipped workshop, and was walked progressively through his thoroughly thought-out process over the next 5 days to emerge with a rather elegant chair of which I am very proud. James has clearly invested heavily to ensure that his students have the best equipment with which to accomplish their task. The workshop is modern, well equipped, well lit, and most importantly for me as my course was in January: well heated ! He has even fitted lights with a full spectrum daylight colour temperature which contributes greatly to the pleasant working atmosphere. The tools he provides are of the finest quality, some being handmade by James such as the travisher and spokeshaves, which he fits with blades from the famous Ron Hock. (These are available for purchase, and I was unable to resist buying one of each having experienced the ease of use and quality results I was able to achieve with these tools). As regards the skills needed, I had had no prior experience (for example) of turning, but in the space of one morning managed to produce four turned legs and three stretchers under James’ tutelage which looked rather good (if I say so myself !) I was also introduced to tools I had never before encountered (eg. travisher, drawknife, froe, adze) as well as some that I had, and found myself handling these quite naturally after guidance from James on their correct and safe use. James is a man totally inspired by Windsor chairs, and his passion has extended to writing a beautifully presented book on the subject (which I now have in my collection). This passion is clearly in evidence as he guides his student makers through each stage in his carefully thought-out process, and he radiates confidence that each of his students can achieve the highest standards.– which we all did ! Last but not least, and probably no less importantly, James has gone out of his way to ensure that his students stomachs are well filled with good, fresh food. I unreservedly recommend this course. What a wonderful week deep in the West Sussex countryside. James Mursell has turned some old farm buildings into a centre of Windsor chair making excellence which keeps alive the skills of the craftsmen of long ago and passes them on to today’s students. The workshop is kitted out with high quality machinery and tools, some of which are made to James’ personal specifications. James is a first rate teacher and all students completed the introductory course having made windsor chairs of which they were justly proud. Also, James fed and watered his students admirably which added to the enjoyment of a super week. Can’t wait to go on the next course. I just wanted to write and thank you for the superb courses that I have attended both at The Windsor Workshop and West Dean College. On each occasion I have felt exceedingly positive about the total experience and consider each of them to be excellent value for money. No matter what chair is to be made, whatever the degree of difficulty of the design, or the extent of the components to be made, the programmes are well-devised and suitably paced to cater for the individual skill level of all the class members. Your interventions are appropriate and timely, thereby enabling every student to leave having experienced a real sense of personal achievement. The workshop organisation, suitability of raw materials, and quality of tools and equipment are of the highest order and each contribute to a marvelous learning experience. The teaching is excellent and your patience to overcome the inevitable challenges faced on each course is outstanding. I most certainly commend the high levels of motivation that you inspire and on each and every occasion I find I cannot wait to try out the new techniques acquired when I return to my own workshop. As a former Member of Her Majesty’s Inspectorate of Schools and Colleges charged with observing, writing and reporting on the quality of Craft, Design and Technology in the nation’s educational establishments, I am pleased to write so enthusiastically about the excellent courses you provide and I give you full permission to share my thoughts with others, in the hope that these comments might be of interest. I look forward with enthusiasm to my next course! I had my first class with James in 2005, I could make several kinds of American Windsor Chairs, a thing I was taught at the school of American Master Michael Dunbar in New Hampshire. I wanted to make English Windsors because I like their high style and and craftsmanship and the look of natural woods. Being taught by James is a different experience. You really make all the chair parts, from splitting greenwood and turning parts to the last sanding, under constant supervision. I learned a lot of things, the first of which being not to say “good enough”!. I made two chairs at the Windsor workshop. Well they are still far from perfection, but they are the best I made, and I know how to go further. There is something almost magical about being told that you are going to transform some logs complete with bark and moss into a chair in five days—and not any old chair, but an elegant Windsor Chair which would grace any living room. This is part of the magic of embarking on a course with James Mursell at the Windsor Workshop in West Sussex . For anyone with the least interest in creating something beautiful from wood; in learning to use new tools that have a long traditional history; or in just the satisfaction of completing a substantial project in a week, there can be nothing better than this course. The magic I experienced depended on the enthusiasm, skills and knowledge of a good teacher—and James certainly fits that description. Never once did he suggest I was doing anything wrong—rather he encouraged me to develop my skills with such phrases as “I find it works best like this.” or “You might find it easier if…” I had never worked with unseasoned work or used tools such as the spokeshave, drawknife or travisher before. Each day I was learning how to use a new tool or a new approach and under James’ watchful eye (and ear!) I progressed to the conclusion of Friday—the completed chair. The magic extends to the surroundings as well. Set in the delightful Sussex countryside with views to the South Downs , the workshop itself is well-equipped, clean and inviting. James has created a teaching environment that makes you want to succeed. And succeed you do, whatever your starting point. If you want to experience a very special, yes, almost magical, week then you can do no better than sign up for a course with James Mursell at the Windsor Workshop. Courses with James change the way you view furniture and its construction forever. I started a complete novice and was gently guided by James through five well planned days, transforming two green logs into a graceful Windsor chair. The feeling of pride as you sit back on the Friday afternoon looking at your creation is almost tangible. James’s lightness of touch and unfailing support builds your confidence. The workshop is a serene delight set in the foothills of the South Downs, warm, spacious and well equipped. Each time has been a most fulfilling week, I recommend it without hesitation. I found it magical that within 5 days a couple of wet logs could end up as a Windsor chair! The whole course was well organised and ran like clockwork. Your teaching skills are excellent and the whole environment is calming with Mozart in the background when things get a bit difficult. I was able to use some old skills, but learnt many new ones, particularly bending wood.